While some might desire to have witnessed the creation of Adam and Eve, few of her contemporaries realized that they were seeing in the young Virgin Mary a new creation that surpassed the old one by far. 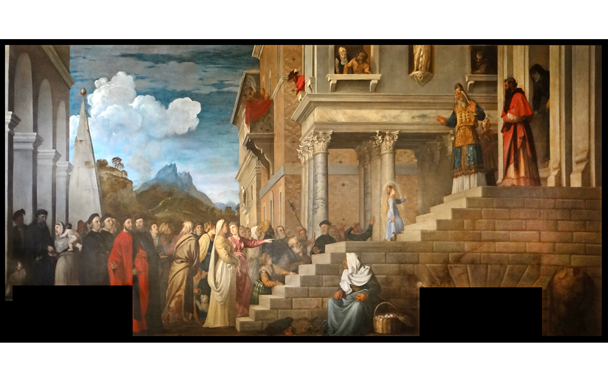 Titian gives us a glimpse of her radiating holiness as she climbs up the stairs to the temple at the age of three in order to live a consecrated life there according to apocryphal writings. He shows us how God’s shining love manifests itself through her, though this is solely perceived, alas, by few; for merely those whose heart has been purified by suffering and transformed by love have the capacity to pierce the veil of the ordinary that covers a sanctity so great that we would shout with joy if only we were aware of its presence. The blessed Mother always led a hidden life, but even more so when she was a child. For the promise of children is generally unknown except to their parents. In this case, both Mary in her humility and her parents in theirs would have modestly kept from the public eye that there was something extraordinary about her. Her presentation in the temple, however, was a public moment where those who wanted to see, could see (to some extent and by the grace of God), if we accept Titian’s interpretation. Perhaps her parents already had an inkling that she was the first sign of the fulfillment of God’s promise to make this fallen world new. Titian in his painting on the subject (1534-8) expresses this perfectly: he who liked to paint extravagant dresses, depicts Mary in a simple blue garment and with features that are not even outstandingly beautiful. It is her inner, shining beauty that is striking, making everybody look at her though with different degrees of understanding. She walks with the self-possession of an adult and the grace of a queen, and at the same time with the openness of heart one only finds in children who expect, if they haven’t been badly wounded, that they will meet love wherever they go. But in the Virgin that openness is absolute: she is full of grace, which means completely imbued with the love of God without any distrust in Him. For we fallen children of Adam and Eve have somehow all inherited to different degrees our first parents’ misgivings about God; instead of running to Him with a repentant heart after they had eaten the forbidden fruit, Adam and Eve hid in the garden. Only Christ was able to heal that breach. And we, though baptized, often take a slow transformation to believe in His unconditional love. Hence the importance of devotions like that of St. Faustina or St. Marguerite Alacoque. Mary ascends those stairs to the Temple with the joy of one who will enter the house of her Father. She comes to give herself completely to Him who is pure Love. This, it seems, overrides any sorrow at leaving her parents which would be very strong in a small child; having such a sensitive heart, she would have felt this keenly (empathizing as well with her parents’ sadness) but she follows her calling which is to love completely and unconditionally. At the same time, she is aware of the seriousness of the occasion which expresses itself in her posture and gait. The High Priest welcoming her in his liturgical vestments is one of the few to realize that something extraordinary is happening here. He too is very dignified and has his arms outstretched in what seems both a liturgical gesture and an expression of wonder at this child so filled with the love of God. The other onlookers express everything between mere curiosity and admiration. They wear clothes ranging from the fashion of the Renaissance to the tunics of the ancient world, and this points to a deeper truth. For the inhabitants of this town (that resembles more a classical Roman city with an Italian landscape in the background than ancient Jerusalem) stand for all of us who let the manifestations of God fall to the wayside, be choked by thorns, remain on the surface – or sometimes bear fruit. Those hanging from the windows and balconies seem merely curious onlookers except for the man in the half-shade in the window-frame furthest on the right who seems recollected and struck by what he sees. Some dignitaries clad in black probably depicting members of the fraternity of the Scuola Grande di Santa Maria della Carita that ordered this painting from Titian stand about and look on with nothing more than polite interest. Mary’s very aged parents stand back modestly, not wanting to take center stage. Joachim turns to Anna, touching her shoulder as if to console her while she looks intently at Mary walking up the stairs. For many years they had hoped for children, only to be given one miraculously in their old age whom they then give back to God after only three years. By the time Mary would leave the temple at the age of 12, they would be dead according to the legenda aurea. What heartbreaking sacrifice this must have been! Not only was Mary such a wonderful child, but also the consolation of their old age. There is one mysterious figure at the far-right coming out of the temple. He looks like death personified, though he might just be a very old man prefiguring Simeon who would hail baby Jesus in the temple a decade later. Should he symbolize death, then he comes to witness the first signs foretelling the end of his reign; for Mary would become the Arc of the New Covenant, bearing Christ within herself who would vanquish death after undergoing it Himself. The presentation of Mary in the temple is thus the first step on her way to Golgotha where she would be demanded the utmost sacrifice. Her gift of self that started in the temple will eventually lead to a complete kenosis, similar to that of Christ on the Cross. He who was the new Temple died so that we could become its living stones. Hence, by presenting herself at the Temple, the blessed Virgin already points to the new Temple that would be destroyed and rebuilt in three days. She thereby opens the path for us, becoming our co-mediatrix. Mary, pray for us and undo the knots in our lives so that we can trust God fully like you. It is a great way to see the painting and to find all the symbolism of the scriptures under the eyes of the painter but also of the time and the sponsors .It is a lecture in theologie adapted to painting lovers.